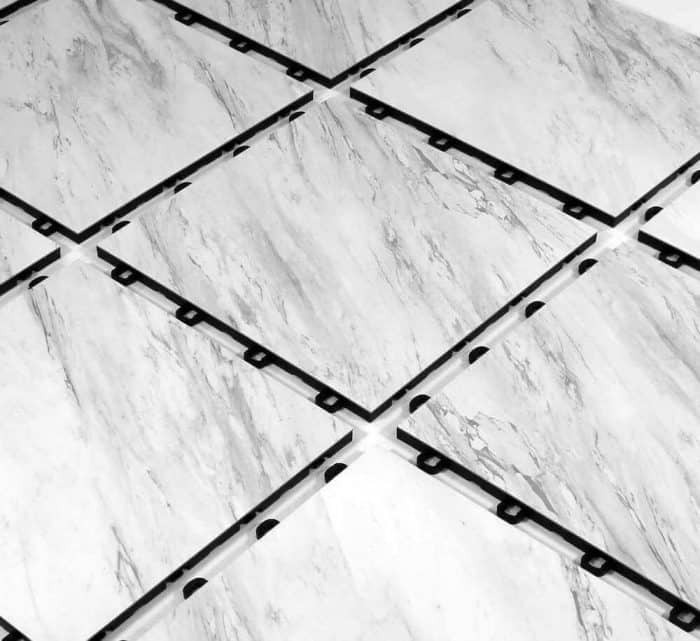 The Vinyl Top Carrara White Marble interlocking floor tiles offer a beautiful stone look for your basement. Each tile has an attractive matte finish and an inconspicuous micro-beveled edge. 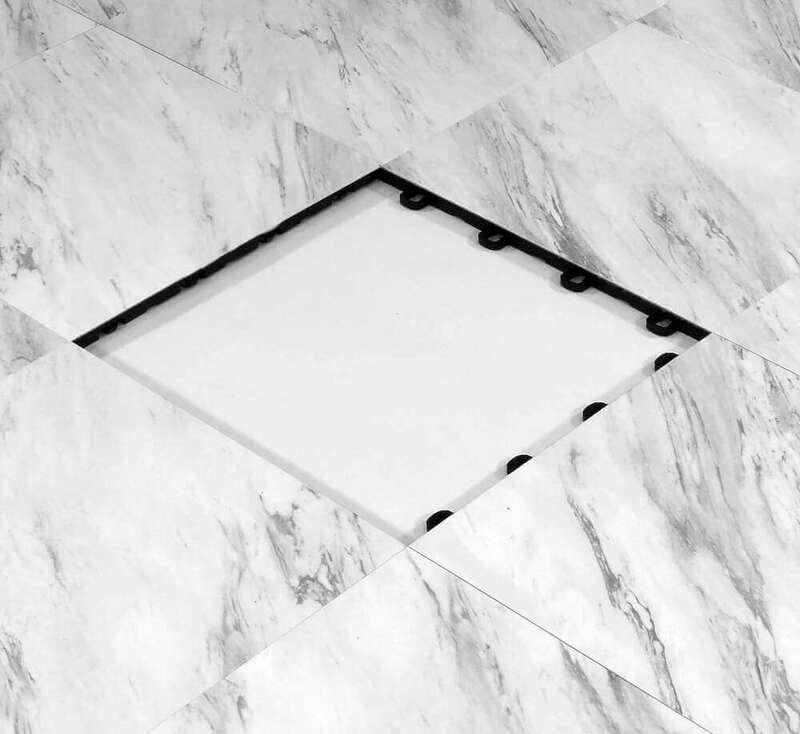 The tile features a convenient loop-to-peg interlocking system making installation a quick and easy DIY flooring project. These interlocking tiles provide a comfortable surface for walking. You may install these basement tiles over chipped or uneven concrete. 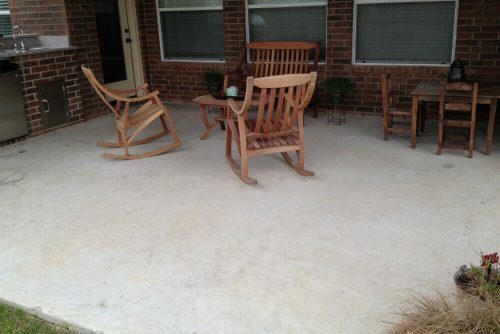 They may also be installed over any flat surface, including carpet, vinyl or concrete. The strong polymer (plastic) base was designed to create a thermal barrier while also allowing ventilation for humid basements. While they were originally designed for use as basement flooring, over the years, our customers have used them as event flooring, particularly for trade shows and convention booths. 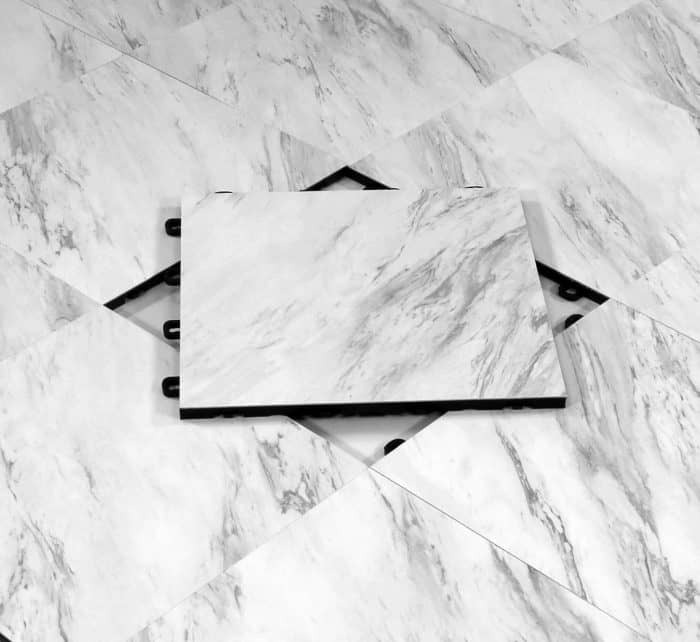 With a beautiful, natural Carrara marble stone appearance, the marble interlocking tile is a gorgeous floor solution for your basement or trade show booth. 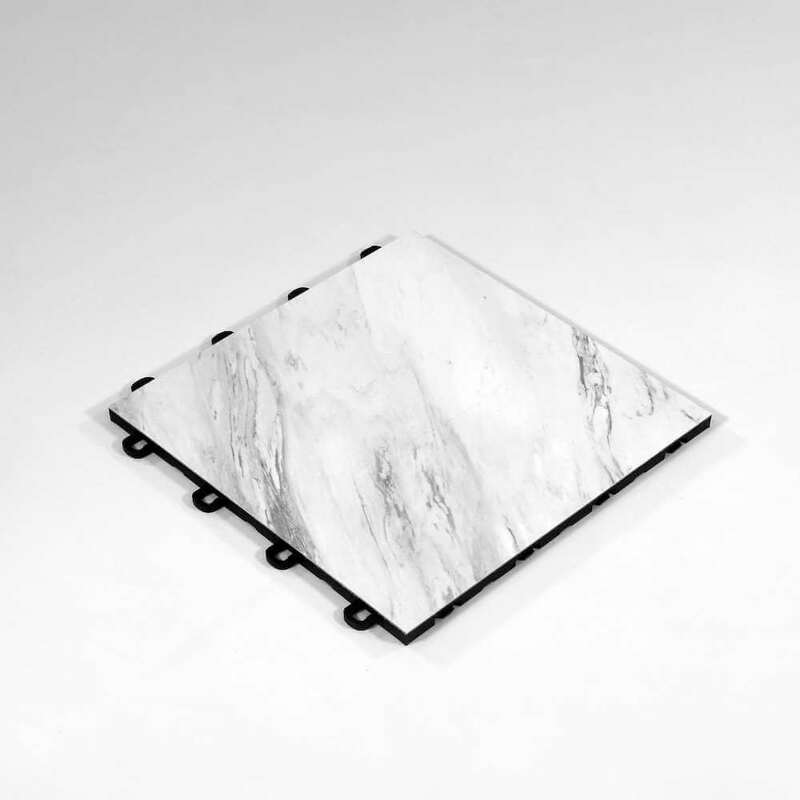 Every Marble interlocking floor tile measure 12 x 12 – inch (1 square foot), which means that the entire square footage of the basement will be equivalent to the number of tiles needed to cover the area. The tiles are 1/2-inch thick. The tiles are normally installed wall-to-wall for basements. If you will need to cut the flooring to install it around any permanent structures such as columns, stairways, or walls, you will need to add about 6% to the square footage for the total number of tiles needed. These additional tiles will cover the waste amount that will be used. To accommodate the flooring for a custom size or shape, the interlocking vinyl tiles can be easily cut with a jigsaw (fine tooth blade). 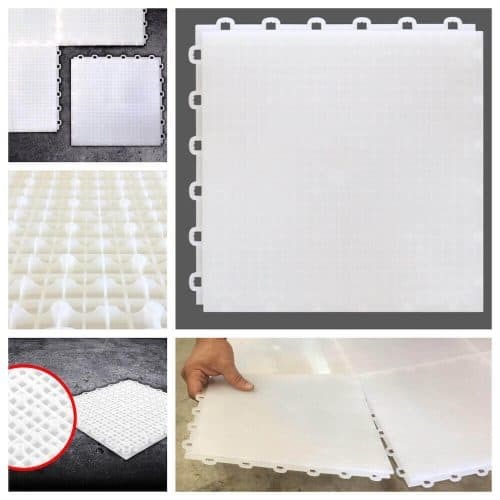 You will need to leave at least ½-inch of space between the tiles and walls or permanent structures because the tiles expand and contract with temperature fluctuations. 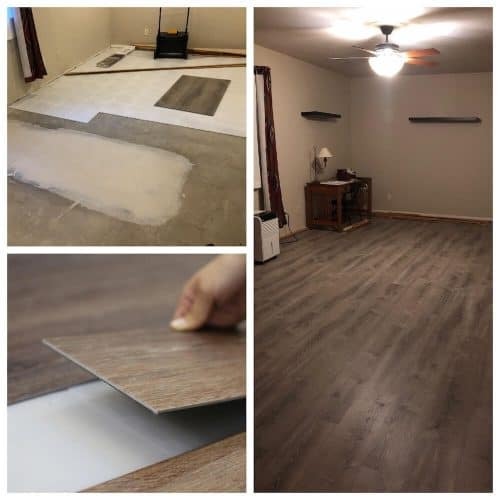 In addition to the easy installation, the flooring can also be taken apart easily in the event of a flood, leak, or relocation. All of the interlocking basement vinyl tiles have a pleasing appearance. The Marble tiles feature the look of beautiful Italian Carrara marble, which is mainly white with smoky gray veining. The Marble tiles will provide an elegant, timeless look to your basement living space or trade show booth floor. Even though the Marble interlocking floor tile is designed to be appealing, it is also durable and long-lasting. Both the vinyl surface and polymer base contribute to the durability of the Marble interlocking vinyl top tiles. 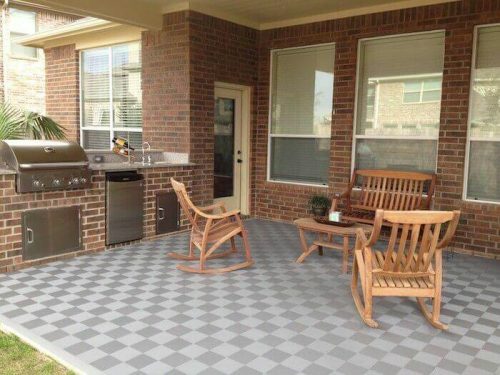 This tile is colorfast and resistant to fading and staining due to the UV protection. The Marble interlocking basement tiles can handle average foot traffic and support heavy weights from storage chests, pool tables, entertainment centers, and other furniture typically found in a residential basement. However, we suggest that pinpoint objects be placed over a mat or furniture sliders to distribute the weight. These interlocking tiles can be easily cleaned with Swiffer products or water and mild soap. With this in mind, we suggest that clean them regularly in order to extend the life of the floor. Underneath the Marble interlocking floor tiles lies a grid structure. This layout was specially designed to resist mold and mildew growth by allowing air circulation for the escape of moisture and humidity. Not only does this grid foundation offer ventilation, but the structure itself is made of high-impact polypropylene. This kind of plastic is known to be antimicrobial and repels microorganisms from developing on its material. Despite its mold-resisting properties, this basement tile is best used in climate-controlled basements. When installed on concrete that is sloped toward a drain, any water will flow down beneath the tiles. Additionally, be advised that a low, hollow sound may be observed when walking on the tiles. This is caused by sound echoing through the grid structure. 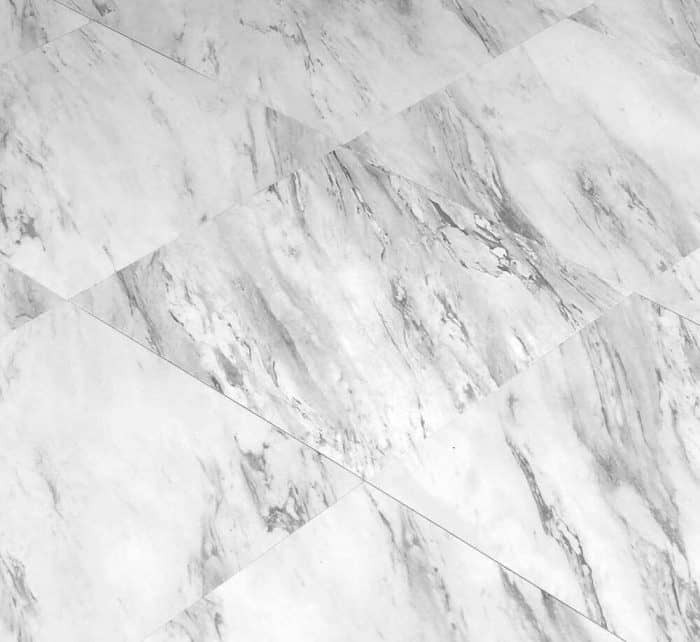 The Marble interlocking tile has a clean white ground color with subtle gray veining giving a stone appearance. With its unique look, it may be used in trade shows, commercial displays, home offices, and much more. Many of our customers use the tiles for convention booth flooring because they are portable and light. Your flooring project can be installed quickly and effortlessly. Buy them today! Just add them to the cart and proceed to the checkout page. 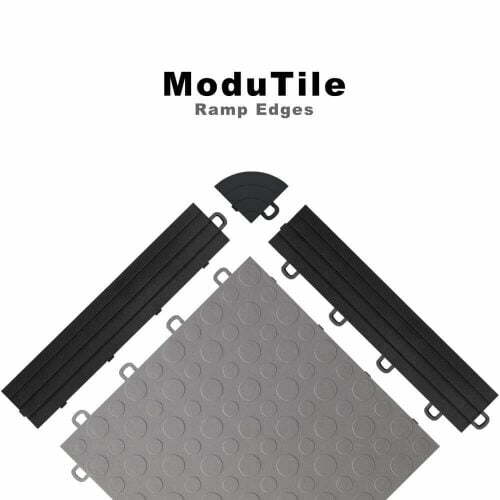 Feel free to browse ModuTile Basement Floor Tile – section to view our other vinyl top interlocking tiles suitable for an indoor flooring option. As always, if you have any questions please do not hesitate to call us at 713-663-6060. We have searched high and low for a product of this calibre. Once we found Modutile, we were very happy and satisfied with the professional appearance of the black marble tiles. 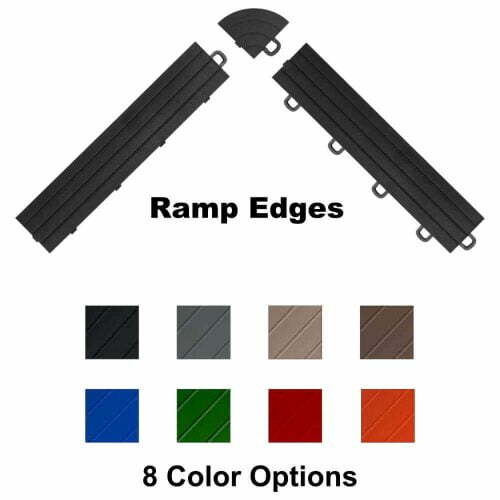 We have ordered this product multiple times and are satisfied every time. I can’t say enough good things about the customer service we received! Not only was Modutile able to deliver, but they went above and beyond to work with us in our delivery and timing. 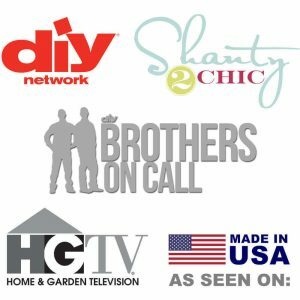 We will continue to partner with Modutile because of this!!! A big THANK YOU to Max from us at Dyson!!!! I finished some time ago; yet I always kept putting things aside. 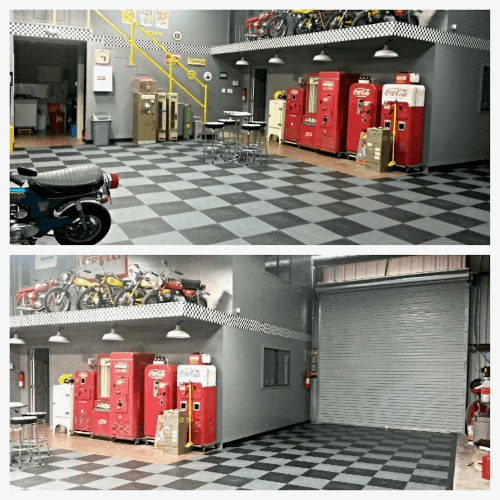 The first 2 pics are of what the floor USED to look like. The following after pics are a progression of what should look like when I am completed with all the transitions of floor/ walls/ etc. Thank you very much again and sorry for the wait. Our order shipped very nicely. Thank you. We used it at the event and also for our photo shoot! We will be in touch tomorrow to order more , our second exhibition is in 8 weeks. I bought this dance floor a year now and my customers love it. Max helped me with the calculations for my order and shipping was fast. Great product and great service.. I purchased these marble tiles to finish a small basement. They look great. Once the prep work was done, it only took me about 2.5 hours to complete the floor. It took that long only because I need to cut some of the tiles. I was worried about how the tiles would hold up to being cut by a saw but there was no problem. I will definitely purchasing more of other tiles to complete other basement rooms. The floor is SO PERFECT. 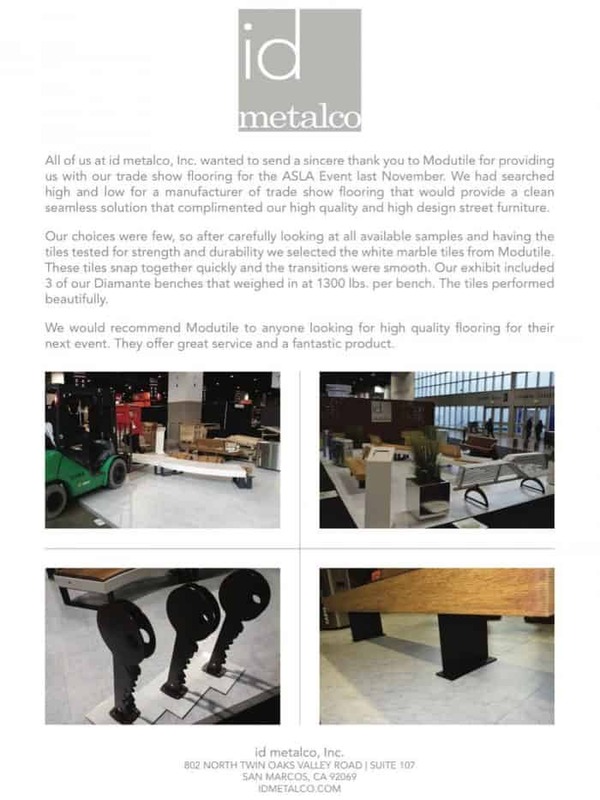 I am going to send everyone to Modutile to get the most perfect Trade Show floor in the world. It was a breeze to setup and it looked GORGEOUS and just as simple to take apart. I cannot say enough about how much I love it!! Next time I do I show I’m getting some of your cards and passing them out. Thank you for such an incredible product. I just received my order of 285 square feet of Modutiles (Black & White Marble)… They are beautiful looking & are nicer than they look on your web-site. Thank You for the nice product & the very fast shipping across the U.S.A. The United States needs more company’s like yours..
live in Monroe, PA and we purchased 700 sq ft of white marble tile for our basement. installation took our whole weekend because too many cuts needed. Outcome is superb. Great product,recommended. The dance floor is to the left as you enter the tent with rope lights surrounding it and it is in front of the DJ. It was the highlight of the party! The kids went crazy about it and my son says they are still talking about it. Thanks again for all you did to ensure the floor arrived as promised and on time. Your personal attention to detail like calling to make sure I had the right info from Fedex and calling to make sure the dance floor had arrived and being so sweet to me on the phone meant the world to me. I only wish more people were like you in making major purchases!